Tips and Tricks for fix SONY XPERIA C (C2305/S39h) problem solutions. The fans of Sony still can get their big screen 5 inches LCD smartphone with cheaper price, there are SONY XPERIA C (C2305/S39h) who have 5 inches screen and already powered with Quad Core processor from Mediatek, of couse the price is little bit different with Qualcomm processor, but you can try to use the demo this smartphone first before buying. The SONY XPERIA C (C2304/C2305/S39h) also know as Pelican. How to Fix or Problem Solving for Recovery SONY XPERIA C (C2304/C2305/S39h) hang or not responding or malfunctions or stuck or freezing or bricked ? If you are average user, than there are almost no different between using Qualcomm vs Mediatek processor, because you can run almost all applications from Google Play Store without problem. With this Quad Core processor plus GPU from PowerVR will give power to run HD Game also. But not all applications created with good conditions, some of them are not compatible with SONY XPERIA C (C2305/S39h), which can make hang or stuck or bricks or frozen or LCD touch screen not responding. If you get this problem, try to do soft reset or reboot or restart SONY XPERIA C (C2305/S39h). If that problem still happen, then you need to do hard reset or master format. How to Soft Reset or Reboot or Restart SONY XPERIA C (C2304/C2305/S39h) ? The battery of SONY XPERIA C (C2305/S39h) is non removable battery, so we can not open the battery to do soft reset, if something happen or frozen, try to press power button several second until it will be restart by itself. If the phone still can be access, and need to soft reset, try to press power button several seconds, until menu appear. Choose restart/reboot than the SONY XPERIA C (C2305/S39h) will do the soft reset or restart. This is safe to do because all data or installed applications will not removed. We can find soft reset or shutdown button at Sony Xperia C at back side after open the back case. The reset button location is located beside the simcard slot (hidden if we do not open the back case). We have to use small pin or paper clips or pen to access the reset button. Press this button when our Sony Xperia C is stuck or freeze when we run applications. 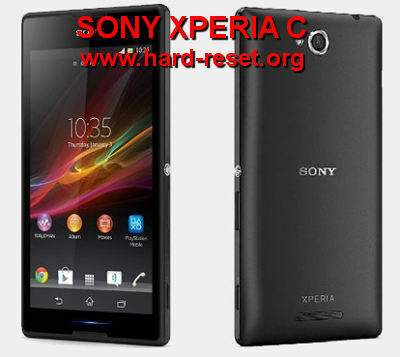 This reset button will force shutdown or force soft reset SONY XPERIA C (C2304/C2305/S39h). This reset button will not remove any important data as well. The SONY XPERIA C (C2305/S39h) will continue the step until ready to use in clean factory default. Follow the menu at you computer display, it is easy to understand the steps. Another alternative for hard reset Sony Xperia C, start again from number 1 until number 3, and continue press and hold Power Button + Volume Up + Volume Down together until the Logo appear and reelase all button. Finish the PC Companion step and until it doing Factory Reset to SONY XPERIA C (C2304/C2305/S39h) to factory default Android operating system. How to Restore and Reinstall Clean Android Operating system / firmware at SONY XPERIA C (C2304/C2305/S39h) ? Like other computerized device, sometime SONY XPERIA C (C2305/S39h) also need to be reinstall or restore the operating system with clean and factory default setting Android OS. To do this, we do not need to copy anything from outside SONY XPERIA C (C2305/S39h), because the operating system already saved safely inside SONY XPERIA C (C2305/S39h) rom. Reinstall can be do easily by everyone, just do master format or hard reset step above, then the clean and factory setting Android operating system will be reinstall or restore by itself. Please remember, doing reinstall will delete all your important data and applications, please do backup first beforo reinstall the operating system. How to Unlock or Fix or Bypass or Solutions for SONY XPERIA C (C2304/C2305/S39h) forgot password code or security lock screen pattern or pin (lost password)? There are several options to protect SONY XPERIA C (C2305/S39h) while we are away from it. We can choose giving password pin or screen lock pattern for security protections. If we are forget about the answer, the Android already give solutions to bypass forget password. Try to find Forget Password / Pattern button then press that button to bring us for answer the Google account username and password that already at this phone before. If we can not access the Google account then the only solutions we can do is doing hard reset or master format above. How to Improve Performance SONY XPERIA C (C2304/C2305/S39h) to make run more faster? Quad Core processor 1.2Ghz will give you faster way to run Android applications, but after using several months, maybe some user feel that the phone speed become slower. As far as we know, some SONY XPERIA C (C2305/S39h) become slowly because there are many applications who run in the background and do update or other job together, this will make the phone resource become slowly. To make SONY XPERIA C (C2305/S39h) performance back to run faster again, please try to uninstall not use applications. If your SONY XPERIA C (C2305/S39h) still need to make faster, you can consider to do hard reset or master format. Is That Any Secret Code for Doing Format SONY XPERIA C (C2304/C2305/S39h) ? There is no secret hidden code for SONY XPERIA C (C2305/S39h) to make it back to factory default. Do the options above to hard reset it. The battery of SONY XPERIA C (C2305/S39h) is non removable, therefor we can not easily change or remove the battery of this phone. We can open the back cover of SONY XPERIA C (C2305/S39h), but we still need the special tools to open or remove the SONY XPERIA C (C2305/S39h) battery. We should need to open back cover of this phone when we want to access the memory card MicroSD and to access the SIM card slot. As we know the battery of SONY XPERIA C (C2305/S39h) capacity have 2390 mAh, we can use this smartphone fully day without charger, but some user have bad experience with SONY XPERIA C (C2305/S39h) battery life, to make this phone battery work longer life, we should make some setting to save battery life. Please reduce the LCD brightness, and disable all not use connectivity like Wifi or Bluetooth or GPS. This will help us to keep the battery saving and not too fast to drain. How to Upgrade SONY XPERIA C (C2305/S39h) Operating System to Latest Android Operating System Update ? There are some firmware upgrade which can we can from OTA (over the air), mostly comes for fix some bugs and improve some features. But we can not get official Android Update for SONY XPERIA C (C2305/S39h) such as Android Nougat, Android Oreo, or Android Pie. We recommended to always use official firmware, because if we flash with custom ROM, then some features can not work properly. [A] Hi, perhaps your MicroSD has been corrupt, please try to use different MicroSD simcard. [A] Hi, first you have to try use different Android power charger with minimum 1 A current output to make sure it is not broken. If still can not work, then please try to follow steps at #option 4 above to re-flash your operating system to factory default. After doing all possibilities but the problems still happen, then you have to consult with Sony authorized service center. The information from this page describe about how to reset Sony Xperia c,hard reset xperia c,sony c2305 hard reset,how to hard reset Xperia c,how to hard reset sony xperia c,sony xperia c2305 hard reset,how to reboot sony xperia c,hard reset sony xperia c,sony xperia c3 hard reset,c2305 hard reset. If you need another resource for hard reset, use search function at this homepage or find from our related posts. How to Easily Master Format LG X MAX (K240H) with Safety Hard Reset? Hi, what happen that make it bricked? If you change or try to flash with other non official firmware or operating system, then it may happen like that. If you never do anything with the official firmware, first think to do is doing hard reset with hardware key button. Other alternative for your Sony Xperia C is doing flash it with Sony Xperia PC Companion application or Flashtool application. Wtf my internal storage is only 1.2G?? If I am not mistaken, the internal storage for xperia c would be 4G right?? Hi, there are an option to erase all data in external memory card when doing master reset at setting menu, you should unchecked the erase data external memory card before doing master reset, but usually that option is blank by default. When your memory card is blank, it mean that data already erase together when doing master format. You can try to recovery with undelete applications from computer (please try Recuva file recovery and undelete), some file can be recover or undelete, but it’s not always working good, just take your time to try and hopefully your data will be back to your external memory card. About the internal storage, almost all Android smartphone will use some of internal storage as their location to save source file of operating system and also the running operating system that we use right now, that are also include the other factory default applications and laucher, that’s why we will not get full 4G. Hi, to activate 3G at your smartphone, please try to go Setting > Mobile Data > Network Mode , choose : GSM / WCDMA auto. the GSM mean 2G, WCDMA mean 3G HSDPA connection. With this setting, our Xperia phone will chose automatically which the best (2G or 3G) by itself. Hi, if you can not use GSM Internet or Wifi Internet, then please check your Sony Xperia C setting Flight Mode active or not, please make sure the airplane mode is not active. If the setting are fine but your phone still can not access Internet, then please do hard reset to reset all setting back to factory default. Hey my xperia c freezes n the display turns out black…ir didnt switch on…whats the solution???? Hi, please try to do hard reset with hardware button with the step above. Other alternative you can do with connected Sony Xperia C to computer using PC Companion applications. Please follow the option 4 step at this article information above. my sony xperia c cannot restart,have no function,i try to reset already but still cannot,when i charging got light but cannot restart the phone! why? Hi, if you already try to follow the hard reset or master format step but the problem still happen, maybe your Sony Xperia C have hardware problem. Please try to go to Sony service center for further hardware test. my sony xperia c cannot restart,have no function,i try to reset already but still cannot,when i charging got red light but cannot restart the phone! why? and , i cant flash my mobile with flashtools and , i mean the PC doesnt recognize my mobile ! do you think that disconecting the battry conector wil be helpfol ?? Hi, if you can not go to setting menu inside your Sony Xperia C operating system, then you need to try doing hard reset using hardware button. You can also use PC Companion, but if you said that your computer could not recognize your phone, then try to make sure your computer PC connected to Internet, then use USB cable to connect to PC Companion applications after this apps said to connect with pressing volume button. Usually the computer will search for proper driver automatically from Internet. However, if you still can not connect to PC Companion at your computer, then try to use different other computer and install it with PC Companion as well. hi,can you help me to get the xperia c driver? because i have change the system using root and now it bricked. it can on but stuck on animation boot. i allready have the flashtool file and firmware and when i try to flash it,it stuck at 0%. the pc companion didn’t recognize. mtp device driver cannot be installed. Hi, first we just need to remind that doing root is not recommended because it could make our smartphone become problems. Actually in some situations once we connect the Sony Xperia C to computer with Windows 7 (or other Microsoft Windows version) operating system, then the computer will find out the driver by itself using Internet. If you can not do that, please try to connect with other computer. If you can not find solutions for the bricked Sony Xperia C, then you may need to bring it to nearest Sony service center. Hi, first you need to make sure the internet connection is running well in you Sony Xperia C, usually the problem with not stable internet connection happen because the simcard problem, please see the provider APN, make sure everything in the right value. Other alternative to try by use Wifi data connection and try do download again, if everything work normal, then you need to bring or ask your phone provider for the right setting or solving GSM data connection. I am using experia c2305. I have set SD card as default memory but I am unable to take picture as it says memory full though there are around 14gb free space on my sd card. On top of that I deleted some video files, still I am facing the same issue. Hi, please try to check your memory internal and external capacity from : Menu Setting > Storage. You will see the exact capacity for your internal and external storage. This is important step to force default Camera Applications from Sony Xperia C to save photo to External Micro SD: Please open default Camera applications, Choose setting menu, Choose Data Storage, and choose SD card, after that all Photos and videos are saved on the SD card. Hi, if you already try to hard reset but the problem still happen with not finish booting process, then you can try one more time to hard reset using PC Companion like Option #4 above, please download the applications with you computer, and install it there. Prepare USB data cable (Sony charger cable) to connect between Sony Xperia C with computer, and follow the step from PC Companion. I do had it also but after Hard reset with pc companion it still show booting process never end until empty battery. help please. Hi, maybe you bring locked Sony Xperia C that only work to your China network provide. Usually this situations happen because you buy the phone with special package price for minimum contract with your network operator. So you can not bring you phone to other country, but you still can use it anytime when you are at your provider network. Please try to contact your China network provider support, to ask weather you can have roaming with special operator at Zimbabwe, this conditions can make the phone still work because you are not change the card, but maybe some additional fee will be charged because we use roaming network at other country. 1. when i’m calling someone, the phone turns to blank or black on which you cannot see whats happening on a call…same also with the incoming calls it turns to black as well. 2. I tried to use Mobile Data but unfortunately it didn’t work and tried it so many times following step by step procedures from Sony users guide. Hi, for call problem, I think this is because application problem. Normally, the LCD screen of Sony Xperia C will keep turn on when you received a phone call, as far as the sensor has not covered with our head when the phone closed to our ear. If you think this problem does not same with your previous Sony Xperia, then you can try to perform hard reset to clean and reset to factory default setting. This is also similar with the mobile data, basically this phone will run without problem when our simcard provider does not have problems. Try to change your network card to make sure about that. Please also see the Setting Menu for Mobile Network, make sure the data is enabled. However, the following problems if occur because of wrong setting, will be reset to default if you do hard reset. Please make sure your important data already backup before performing hard reset. Hi. I lost all my photos and songs. I’ve tried to recover all my photos and songs but i don’t know what should i do. Is there anyone who also faced the same problem as mine please help me. Besides that, my battery also drops from 30% to 13%. After 13% the battery stop dropping, can somebody please help me? That’s really annoyed me. Hi, deleted files usually can not easily recover from our memory card, especially the internal memory which also write temporary files and something like that. We can try to use some undelete applications, but the result can be hard to recover base on what happen before. About the battery, when 30% drops very fast to 13%, we should make sure about the background applications which run without any notice. Find it from Setting > Apps > Running. I also have this problem in my Xperia c battery drains very. fast from 30 to 13% in 3 or 4 minutes.. nd after 13% it works normally..
Hi, there are some causes that can make your Sony Xperia C battery life fast to empty. Most trouble with battery drain comes from applications. Usually we have background applications that make your phone can not deep-sleep when not use or standby (wakelock problem). This will make your battery become consume more and fast to drain. But as far as we know, battery from 30% to 13% only 4 minutes is really fast and strange. Maybe something wrong with your hardware or operating system. We suggest you to do hard reset first using setting menu and remove everything back to factory default. If the problem still happen, try to charge your Sony Xperia C using other Android charger adapter, the other problem maybe your battery need to change with new one. Update your xpc system to 16.0.B.2.13. For your info this will fix the battery issue. mine fixed. 16.0.B.2.16 is the newest system update but ‘computer required’ no OTA for now. I am playing a game asfalt 8 and i the between my phone is hanged. Power buttons are also not working as you suggest. There is only game screen on my phone and a little sound. Please help me. Hi. Can you help me my xperia C2305 is not clear in the front camera,how can solve that problem, ? Hi, some problem with front camera not clear when taking pictures can be solved by clean the front camera lens with lens cleaner. Some users also use special liquid for clean camera lens. If your camera lens of Sony Xperia C has been cleared, but the problem still happen, please try to download 3th party camera from Google Play Store, then try to take photo from this 3th party applications with default setting. If the problem still happen, then you should consider to try doing hard reset to clear and make all setting back to factory default. Hi, please try to do hard reset after doing upgrade the Android operating system. When I am trying to open video file, message appears ” No flash File Found” as a result I cannot play video files. Hi, there are many file types for video movie, one of them is Flash move or FLV (Flash Video) which is video filetype base by Flash format. This FLV file need special player to play at our smartphone. Please try to download 3th party video player from Google Play Store, we recommend to download MX Movie Player or VLC Video Player, both of them is free to download and we have been happy with that movie player capability for our Android, they can play many kind of movie player without any problems. Hi, for playing some media at you Sony Xperia C, you need to match the codec. For standard movie, they seems can play without problem at your phone, but for non usual codec, then you need to use other player. Please try to download VLC player from Google Play Store, then it could play many kind of media with various codec without problem. May I know? sony xperia c run storage is ver full.every time.what about this !Can u explain me? what did u do this problem..
Hi, the Sony Xperia C have 4GB internal memory size. Actually this internal memory size is not too big to keep your data, especially when you do not use external memory (microSD) then all your photo also will saved inside internal memory. First you must use external memory and move all downloaded files or photos to external memory using filemanager. Usually the memory of Sony Xperia C running out of space if we have downloaded many applications from Google Play Store. You can try to see how many applications and files which use internal memory using Menu Setting > Storage, wait for several seconds to calculate the content of your phone, after finish calculating, you can see the total capacity use by Apps and Pictures and Movie etc. Doing hard reset will wipe/erase all data from your phone and of course you will have more free space again like new. Comprei um sd de 8GB para o meu Xperia c2304, mais toda vez que eu desligo meu celular os App instalados no sd são automaticamente apagados. Hi, we answer in English. Usually most of installed applications will be stay at internal memory. We suggest to do hard reset and try to install application one by one to make sure the problem already fix with that. Hi, that’s right, to secure your Wifi Hotspot connections, then you have to give security password, so only specific user who know your wifi password will connect to your hot spot. To give security Wifi Hotspot password at Sony Xperia C, you have to go Menu Setting > Wireless & Network > More Tethring & portable Hotspot > Set up Wi-Fi Hotspot, then select your security to WPA2 PSK drop-down and give Password at password field. Please remember, this option menu should do before you activate your Wifi Hotspot. So, you need to turn off your Wifi Hotspot before give password Wifi protection. Hi , i have problem with my xperia c. I FORGOT my password and i cannot hard reset it. healp pls! Hi, when you forgot the password of Sony Xperia C, then you can try to recover or unlock or bypass it using the same Google account or Gmail username and password that you have already sign-in at that phone before. Try to give several time wrong answer continuously until the phone freeze or locked for 30 seconds, you will see Forgot Password button, press that button to try unlock or open forgotten password with Google account. Please make sure your Sony Xperia C Internet connection is active while unlock using Google account because this phone will connect to Google server. If you can not access your Google account, then you have to do hard reset with several option above, either hard reset or master format to factory default using hardware button key at option #3 or using PC Companion software with your computer using option #4 above. Hi, I have been using sony xperia c from past one month and facing some problems and because of this im not at all satisfied with this phone. 4. Phone has become very slow even though i’m not using much apps. Please help me to resolve these things. Hi, there are many causes that can make our Sony Xperia C become slowly or hang while running some applications. We will try to answer all 4 number together. The most important think you need to make sure the ROM or internal memory is still enough or not to small. Try to see from Menu > Setting > Storage and see the Internal storage available size. If the memory is nearly full, what makes that happen? although we are not install to many applications, but some applications will keep data cache at internal memory like Facebook / SMS / Email or other similar applications. If you are not use external memory, then some photo and downloaded files from browser will be keep at internal storage. If you still get problems, you could try to consider doing hard reset for restore operating system to factory reset and also remove all applications cache at internal memory. Hi, it looks like that you have already rooted your Sony Xperia C and do some tweak options that make some trouble with your memory card. Unfortunately, there are no standard solutions for your problems, because the non official ROM or Root might be happen with some different steps. Please find some solutions from your previous reference community, maybe they can help you to make your internal and external storage access again. Hi, it is strange because by default Google Play Store already installed as factory default application. Maybe you or someone else ever do root and uninstall Google Play Store by accident. Although we are not sure it will work or not, but you can try to reflash or reinstall latest update firmware using PC Companion that you can download from Sony official website. Follow the steps #Option 4 above. After download PC Companion, install it at your computer, and follow the information to reinstall your Sony Xperia C using PC Companion. Hi, to activate 3G at Sony Xperia C, try to go to Menu Setting > Mobile network > Preffered Network type, choose 3G. The second options that you can do, try to dial*#*#4636#*#*, it will go directly to Testing menu, choose Phone Information, and at Set preferred network type, choose WCDMA preferred or WCDMA only. hii everyone….i need one important suggestion my friend got me a Sony xperia c s39h phone from China but in india it is not supporting google application such as play store,youtube,gmail etc, so kindly suggest me how can i completely format and install indian android software so that this problem can be resolved. Hi, if your Sony Xperia C does not have Google Play Store, then you should try to install just for the Google Play Store applications, so you does not need to reinstall the firmware or operating system unless you use other custom ROM, but we are not recommended to that for standard user. Please try to download Google Play Store APK (file that you can run from Android operating system). You can try to use this link http://forum.xda-developers.com/showthread.php?t=1996995 to download the latest Google Play Store APK. After that you can use File Manager to run it from your Sony Xperia C. Once installed, you will find Google Play Store from your application Menu. hi bought a Xperia c 2305 but it is very slow mobile..
apps does not open in any network..
Hi, basically the Sony Xperia C is quite good smartphone to use for daily activity such as email, browsing, chatting, watching video movie, playing some games and doing more work. But maybe your phone can become slowly after you install and running several application in the background. Please try to remove some not use applications. But if you still need to make your Sony Xperia C performance run faster like beginning, then you have to do hard reset with above steps. Hi. i have a question. after the hard reset, can i have back all the apps like when i first buy this phone. like playstore, walkman, album and etc…. Hi, yes you can. Hard reset process is the same situation to reinstall the factory default operating system include all default applications from your Sony Xperia C like Google Play Store, Walkman, Album and many of them. You only have to re-download other previous installed applications that you have downloaded from Google Play Store after login or signed in with Google account. i’m using sony experia c2305…i’m facing the problem while running internet on sim 1 while i receive the incoming calls on sim 2….i’m running my internet through vodafone 3g on sim 1 but as and when i receive the incoming calls on sim 2 on other network …..internet get stopped automatically on sim 1 at the time of receiving the calls on sim 2……..can u pls suggest me any remedial action for this ?????? Hi, basically Internet should not work or stop the connection when we received any phonecall, either from sim 1 or sim 2. It should happen at your Sony Xperia C as well. Hi, you need to try doing hard reset or master format with hardware button like steps at #Option 3 above. You also can try to flash or reinstall the latest operating system using PC Companion like steps at #Option 4 above. Hi, there are some installed applications at your internal memory which keep the data in that location as well, like Facebook or BBM or Twitter or something like that. In some some smartphone, although we have about 200MB free memory, the new applications still can not download from Google Play Store, this situation also happen for some apps which need to get update from Google Play Store. Please try to delete Data at internal memory beside remove only cache, and you will get more free space for your Sony Xperia C to download the applications. Hiii anybody tell me 8 mp camera of sony Xperia c not satisfied photo quality. How to improve camera quality. Hi, maximum resolutions for Sony Xperia C is 8 megapixel is 3264 x 2448 pixels, as far as we know, the camera of Sony Xperia C can give good photo result. However, the camera quality can be vary depending on the light situations while taking pictures, also please make sure the lens is not dirty which sometime user not aware about this problem that can make our pictures become worse. Hi, my sony xperia c have problem on restarting. I had updated my xperia c software to 16.0.B.0.21 through sony pc companion..1st the software had downloaded from net. After that when am updating my software by connecting via usb. But suddenly because of power failure the system shutdown and the update process was incomplete. After that I can’t able to restart my phone. It restarts automatically repeatedly n only the sony logo comes. Within few second again display become black and again sony logo comes for few seconds. PLEASE SUGGEST ANY SOLUTION..
Hi, sorry to hear that. Anyway, this is the common problem when doing hard reset or update the operating system of Android, some users does not pay attention about the power problem that can happen at the phone (battery empty) and the computer without UPS. Sometime when the electricity suddenly off without UPS can make our Sony Xperia C become trouble as well. If this problem happen, then you should ask Sony authorize service center to flashing the firmware with their tools. Hi, we suggest you to try doing hard reset use hardware button at your Sony Xperia C. But if you still get problem, try to reinstall the latest official Android operating system or firmware from PC Companion. Please download the PC Companion from Sony official website, then install it at your computer which use Microsoft Windows OS. After that please follow the steps at option 4 above. Do not forget to charge your battery until full when you want to do this steps. Hi, please make sure you have not installed any battery applications. If you have it, please remove or uninstall and continue reboot / soft reset your Sony Xperia C. You can try to turn off your phone and charge it when the battery not full, normally the light LED will turning on while charging. If the LED still not active, then try to do hard reset or master format using steps above. If the problem still happen, then maybe your LED light already damage and need to replace with new one, please consult with Sony authorize service center. Hi, some problems might happen that make our update become trouble like power failure either from our Sony Xperia C or the computer as well. However, when you get this problem, try to redo again running PC Companion from your computer and run update firmware menu, this process does not need to use your Sony active. Just connect it while turning off after the PC Companion give steps to connect using USB cable. If the problem still happen, then you should bring your Sony Xperia C to Sony authorize service center. Hiii… I am using sony Xperia c2305 since the last 4 months… Now I am not able to download apps from playstore.. Everytime I try downloading an app a msg flashes “unable to download, insufficient memory..” Neither I am able to update any of the installed apps even after I have uninstalled most of the apps in order to free space… Moreover I am not able to do factory reset as I don’t remember the pin… What’s the solution…??? Hi, Sony Xperia C have 4GB internal memory, this is actually not too big if you like to download many applications from Google Play Store although you already have microSD external memory. Because by default most applications will install the main applications at internal memory. Some applications also will save the data file inside internal memory like Facebook or something like that. If you have already uninstalled some not use applications, but the memory at your Sony Xperia C still insufficient, then you should try to find Facebook and remove the data files, do not worry, this steps will not remove your data at Facebook server, only remove data files which is cached at your phone. After that you can try to see the free memory increase. Do this with other applications as well. The solutions for doing hard reset if you forgot the pin, try to do it with hardware button like steps at #Option 2 above. Hi, there are several options to do hard reset, one is using software menu, but this can be done if your Sony Xperia ZR is unlock, the other one is using hardware button. However, if you forgot your security protections, then you can try to unlock or bypass the protection using Google or Gmail username and password. Please give several time wrong answer continuously, until the phone freeze about 30 seconds, the Forgot Password button will appear and by press that button, you will be ask to unlock using Google username and password that you have already signed in before. If you can not access Google account from your phone, then you should do hard reset using hardware button or PC Companion, all steps are inform above. Hi, if you LCD touch screen is not responsive in the middle of running applications or games, then you can try to soft reset or force shutdown the Sony Xperia C by press and hold the POWER button until the phone shutdown by itself. Hi, please give us more information about your trouble causes, are you trying to update using PC Companion or do anything else with your Sony Xperia C? The proper information will give other community member can help your trouble. Hi, the mobile data at your Sony Xperia C is use for activate Internet data connection from your provider. If you have already turn on / enable the mobile data, usually your phone can connect to Internet as far as you already subscribe for Internet service to your GSM provider. However, sometime the H or E or 3+ is not appear at your Sony Xperia C because the phone can not get data connection from your provider, please make sure you are use the correct setting for the APN, and try to soft reset or reboot your phone. If you still can not connect to Internet, then you have to consider doing hard reset or master format. But please backup all important data and make sure your GSM Simcard can use Internet, maybe try to use other Android smartphone to test your card. Than onwards my phone is not starting..
What should I do ? How can I restore it again as factory reset? Hi, the firmware / operating system update using OTA are have 2 steps. First steps is downloading the firmware file from server to your Sony Xperia C using Wifi or GSM Internet service, the second steps is installing or updating the firmware to your Sony Xperia C. If you can not finish download the firmware from using WIFI, you can try to do download again after your Wifi active or can connect to Internet. Basically you do not need to do hard reset while doing update firmware, but at some situations maybe some installed applications can make the update become trouble, therefore, you should do hard reset to clean all not necessary applications, then try to update firmware/operating system from OTA again. Hi, there are several possibility that makes your Sony Xperia C can not work. However, if you still can not find solutions with applications, then please try to reformat using hardware button steps above. Hi, please give more information which install button that not work? If you mean install button at Google Play Store which not work, then make sure you try several applications other then what you want to install now, also make sure your internal memory is not full or have free enough capacity to install new applications. Usually if you have more then 400MB free internal memory, then you can install most applications from Google Play Store. I use Internet through opera mini….but I can’t use Google play,google chorme,google map etc….if I try to use google play it says ” can’t establish a reliable connection to server. Hi, basically Sony Xperia C can run almost all Google applications without problem moreover like Google Play Store, Google Chrome or other Google applications. The problems at your phone seems happen because the connection is not good. Try to use different GSM card, make sure the APN setting is setup correctly or try to find good Wifi connection to connect, and use again Google Play Sore for download some applications. Hi, if you can not find any file manager at your Sony Xperia C, please download it from Google Play Store, use keyword File manager for search the apps. We recommended to use ES File Explorer, it is free to download and have good functions to use. Hi, the Internet speed basically only effect from your GSM Provider, as far as you already setup your Sony Xperia C to use 3G HSDPA / WCDMA. If sometime your phone show 2G/E, then your data connection need to setup to 3G/WCDMA Only from Setting > More > Mobile network > Network Mode, set it to WCDMA Only. Please also remove some not use applications, because sometime some applications need to update their data with Internet, if this is always happen, then you internet connection will be going slower because need to share with some applications.